Journal : Photographic review of medicine & surgery ; vol. 1., no. 5. Description : pp. 43-57,  pl. ; ill.: 1 photo., 1 fig. ; 24 cm. Subject : Teratology — Pygopagus twins. Author caption: "BY WM. H. PANCOAST, M.D., Demonstrator of Anatomy in the Jefferson Medical College, Surgeon to the Philadelphia Hospital, and Surgeon to Charity Hospital." Abstract: Tr. M. Soc. Penn., Phila., 1873, ix, pt. 2, 115-117. Cited: Gould, George M. & Pyle, Walter L. (1898) Anomalies and curiosities of medicine. London: Rebman (p. 179). Named: Millie and Chrissie Smith, 1851-1912. After great persuasion and with the kind assistance of my friend Dr. F. F. Maury (owing to the modesty of the twins and the natural reluctance of Mrs. Smith), the accompanying photograph of them was taken. They clung to their raiment closely, as may be seen, and it was only by earnest entreaty that they were willing to compromise by retaining the drapery as photographed. The expression of their countenances shows their displeasure, as their features ordinarily express great amiability of character. This living example of pygopagus symmetros is named Millie and Chrissie Smith. Dr. Pancoast examined Millie and Chrissie for a distal ana fistulae, however this infection is only briefly discussed in his report. 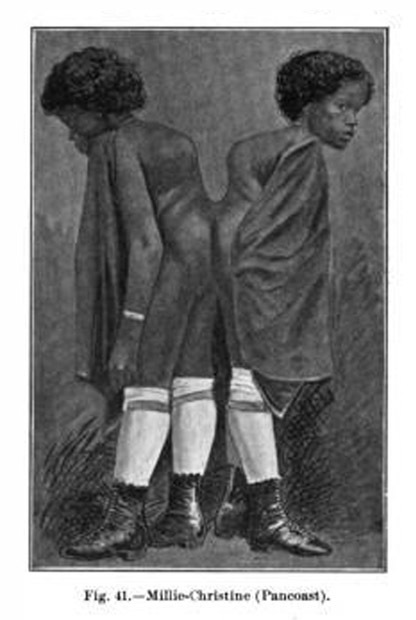 The rest of the document is a description of the contiguous physical structures of the twins with historical references pulled from the literature, in particular a case history of the Hungarian pygopagus twins, Helena and Judith (1701-1723), who were similarly joined at the sacrum. Dr. Pancoast introduced the girls to the medical elite of Philadelphia and led a team of doctors, which included Atlee and Maury, in a series of aesthesiometric and galvanic tests intended to trace the nervous system of their subjects. These tests were repeated in 1878 with different results. Millie and Chrissie were highly intelligent, performed on stage, and mastered several languages during their European tours.